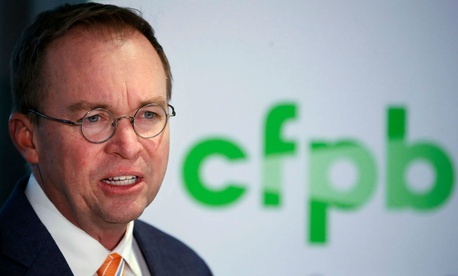 In a victory for the Trump administration’s deregulatory push, the deputy head of the Consumer Financial Protection Bureau has quit her position along with her lawsuit challenging the White House’s appointment of its own budget director as acting bureau chief. President Trump, who last year took the unusual step of assigning Office of Management and Budget Director Mick Mulvaney to temporarily double as CFPB chief, in June nominated former Senate staffer and homeland security specialist Kathy Kraninger to be the permanent replacement for original CFPB director Richard Cordray, now a candidate for governor in Ohio. English’s departure came after a nearly year-long legal battle over interpretations of the Federal Vacancies Reform Act versus wording in the 2010 Dodd-Frank Financial Reform Act that created the bureau. She said it had been “an honor” to work with the staff. Her attorney, Deepak Gupta, said her appeal of an unfavorable judge’s ruling last fall will end. Late Monday, Mulvaney announced he had selected Brian Johnson, currently Principal Policy Director at the bureau, to assume the responsibilities of acting deputy director. Karl Frisch, executive director of Allied Progress, said in a statement, “Mick Mulvaney and Kathy Kraninger could learn a thing or two from Leandra English’s unwavering commitment to the consumer protection mission of the CFPB and her courage to persist even when big banks, predatory lenders, and other powerful Wall Street special interests are doing everything they can to grind the important work of the bureau to a halt." Lisa Gilbert, vice president of legislative affairs at Public Citizen, said her group “commends Ms. English's public service protecting consumers from unfair practices by financial institutions. We laud her courageous stand in litigation against the Trump administration in an effort to uphold key transition elements” of the Dodd-Frank Act. This story was updated with a statement from CFPB Acting Director Mick Mulvaney.